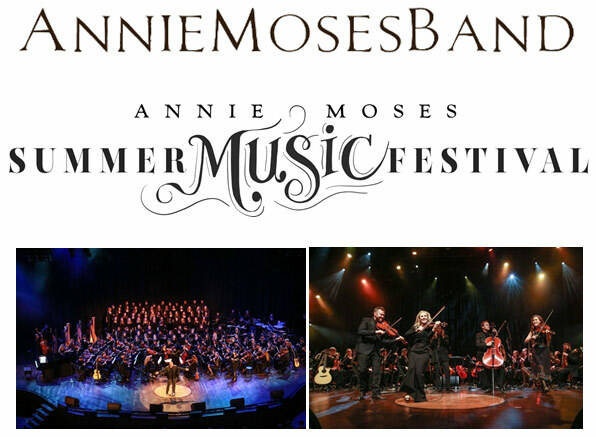 NASHVILLE, Tenn. – Nashville-based award-winning, Juilliard-educated Annie Moses Band, known for its impeccable artistry and genre-defying music, announces today that it will host its highly-anticipated annual Annie Moses Summer Music Festival this July 8 -15 in Franklin, Tennessee. Offering exceptional instruction, as well as live performance opportunities at premier Nashville venues, the Annie Moses Summer Music Festival is a performing arts intensive for young musicians designed to give students life-changing experiences of real-world excellence, while building life-long friendships and taking their art form to the next level. This flagship event, which has become the centerpiece for the band’s vision for the arts and the mission of the Annie Moses Band’s music education 501C3 non-profit – the Annie Moses Foundation, will be held at The Factory at Franklin, conveniently located just south of Music City. Celebrating its 15th year, the Annie Moses Summer Music Festival was founded by the Annie Moses Band, whose members write, direct and arrange the performances for the 200+ young performers who will gather to put on five shows over a single week. The shows are genre-specific and include Jazz, Americana, Singer/Songwriter and Classical. This year’s festival will feature the world-premiere of a brand-new Broadway-style musical by Robin Donica Wolaver and Bill Wolaver, Merry Christmas Uncle Scrooge! based on the Charles Dickens classic story and Broadway Show A Christmas Carol. The week’s events will culminate with a final gala featuring all of the performers from the festival alongside Annie Moses Band and special guest artists to be announced soon. The Annie Moses Summer Music Festival takes a kaleidoscope of instruments and artistic disciplines and fuses them together in a series of professional shows through exceptional instruction from faculty that includes alumni from prestigious music programs such as The Juilliard School, Boston College and Belmont University. The Upper Division of the Annie Moses Summer Music Festival is for ages 11-21and offers Tracks of Study for instrumentalists, vocalists and dramatists. Each performer must choose a Track and submit an audition video. Based on their audition, students are cast in at least two live shows that are written and arranged by the Show Creators. For ages 10 and under, the Younger Division educates children in voice, drama and a variety of instruments. Featuring a holistic approach to discovering and developing the artistic talents of each child, this program is a high-energy event that combines the excitement of musical theater with foundational technical study. Furthermore, specialty courses of study include the Creator Program, which is geared to help aspiring composers and songwriters, and the Artist Development Program designed for aspiring music artists. The Annie Moses Band believes passionately in the power of music and faith to unite families and communities, while equipping and empowering the next generation of musical leaders to elevate society through discipline, grace and beauty. Because of the band’s life-long studies at classical conservatories and its time touring professionally, Annie Moses Band has experienced the power of music to inspire and a way to give back to communities across American through its Annie Moses Foundation. Annually, Annie Moses Foundation has granted $35,000-worth of scholarships to underprivileged students, much of it not underwritten. “Too many musicians stagnate inside practice rooms, handicapped by low standards and poor information,” laments Annie. “Performance opportunities are rare, especially in professional venues. The Annie Moses Summer Music Festival exists to change that. We know first-hand how powerful it can be to perform with professionalism alongside people you love. That's the experience we want to share with you.